This film features the captivating presence of Mona Mårtenson, who plays the titular character with a fresh-faced enthusiasm. 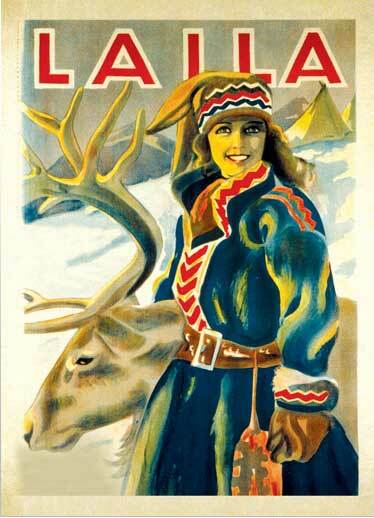 She’s not around for the first hour though, as we see the baby Laila get packed up by her Norwegian parents to get baptized, lost in travel due to a marauding band of wolves and subsequently discovered by nomadic reindeer herders. Some plot machinations ensure that Laila is returned to her parents a year later, but the outbreak of the plague necessitates her return to her nomadic foster family, where she’s especially beloved by Jåmpa, who first discovered her in the snow. The film moves forward 20 years and Laila is expected to marry Mellet, her foster brother who she’s grown up with. But a trip to town ignites her interest in Anders, actually her cousin in real life. There’s an undercurrent of racial tension between the Norwegian people (referred to here as “daro”) and the Lapps, an indigenous people, and the prospect of a pairing between Laila and Anders is all but unthinkable, due to her perceived status as a Lapp. DVD-R has Norwegian intertitles with switchable English and Spanish subtitles. Very good film quality with some pixellization. Approx. 143 mins. long.